On March 26, 2015, Saudi Arabia and the United Arab Emirates led a coalition of Arab states in launching a military intervention in Yemen. Dubbed ‘Operation Decisive Storm’, the campaign was meant to quickly push back the military advances of the armed Houthi movement and restore the internationally recognized Yemeni government to power. Four years later, the war rages on. To understand more about why the conflict continues unabated, how the country has changed in that time and what it means for the people who live there, the Sana’a Center asked five experts on Yemen for their insights. Contrary to a dominant assessment that presupposes the existence of a clear agenda of Saudi Arabia and the United Arab Emirates in Yemen, I have come to believe that it is the absence of fixed objectives and policies that explains much of the failure of Operation Decisive Storm since it was launched four years ago. From the onset, the coalition itself, in which the roles of each country were never clarified, embodied such limits. Rather than presuming that decision-making is centralized (in particular around the two specific princes – Muhammad bin Salman in Riyadh and Muhammad bin Zayed in Abu Dhabi), I think that in fact the war is waged in a fragmented manner, generating much confusion on the field. To a large extent, military affairs as much as political issues have remained improvised. This is because of the lack of trustworthy information coming from Yemen but also due to the illusion of control granted by apparently unlimited military budgets. Most of the Yemeni reality continues to be elusive and to evolve outside of the Emirati and Saudi radars (not to mention Western ones!). Ministries of foreign affairs of the UAE and KSA, humanitarian agencies, the military, local clients and patrons, and tribal leaders all claim to be acting in coordination but are in fact operating separately, if not in competition with one another. Such fragmentation is only emphasized by the diversity of interests of the anti-Houthi camp, which involves actors as diverse as Salafi militias, Southern secessionists, leaders of the Islah party, liberals and heirs of the Saleh clan. Considering the depth of enmity between each of these, it is hard to believe that any coordination can be achieved on a daily basis or in terms of long term objectives. More centralization and authoritarian rule however would be useless. Such a situation evidently impedes military affairs but is also unfortunately jeopardizing peace efforts. The issue is that many Yemenis, critical of the coalition’s strategy, as well as many Western decision makers assume there exists a consistent coalition strategy in Yemen. Conspiracy theories claiming to reveal the higher motives of UAE involvement in the South are popular but should not be taken for granted, much like claims that Saudi Arabia is voluntarily destroying Yemeni heritage or aiming to kill as many civilians as possible. These happen mostly out of limited competence and understanding. Yet, it is also because the consistency of the coalition’s aims is presupposed in the acceptance, by the United States, along with the European Union, to outsource their management of the Yemeni issue in 2015. They thereby left Saudi Arabia on the frontline, implicitly suggesting it was knowledgeable and experienced enough to solve problems that they themselves were unable to understand: the Houthis’ rise to power, Iranian encroachment, Saleh’s resilience, and inter-Sunni competition. While trust in Saudi Arabia and the UAE has evidently eroded in European capitals and in Washington over the last four years, Western diplomats appear yet to fully accept the idea that the war lacks strategy and coordination. Increased popular and political pressure, in response to the deterioration of the humanitarian situation in Yemen and the assassination of Jamal Khashoggi, may finally favor a reality check. Yet, as time goes by, Yemenis are paying an increasingly high price – one that neighboring countries on the Arabian Peninsula are also likely to pay, as the collapse of Yemeni society will not happen in isolation. Our destiny was once linked to a revolution. It was to build me a homeland that could give me the love of home, a place I could call my own. In that home over the horizon I was finally able to converse with my future and allowed myself to plant my first flower, my daughter Shams. On March 23, 2015, I lit the first birthday candle for my Shams. Then, three days later, at dawn, I was crouching under a desk with Shams in my arms in the corner of our beautiful hallway. I did not know where to hide her as we witnessed the first strikes on Mount Attan, a mountain that was separated from us by only a road and a cache of death. We were counting the days by the number of falling missiles and we lost track of how long we remained there. One day, we decided to defy the sounds of war from atop Mount Attan, arriving loud and clear through all the windows of our home. By April, Attan was more than thunderous explosions. It was a daily barrage of missiles, one after another, with which we counted our breaths and thought each would be our last. Our breaths cascaded with the rise and fall of the curtains, in harmony with the missiles. One missile threw us into each other’s arms in fear. Another had us steal a kiss in search of the truth that were still alive. A third knocked us apart. Six missiles in a row. The situation defeated our laughs, delayed our tears and could no longer bear the possibility of us making mistakes. Even the khat leaves had become bitter, their effects no longer stilled the hand that grasped the branch. The scent of jasmine was rendered under the burning stench of the missiles’ dusty aftermath. We made an unspoken agreement to gather what we needed for a day or two. I carried Shams in my arms, looked back at my house and promised it that we would one day return. As soon as we crossed the new bridge that connects Hadda to Attan the sky was lit up behind us as if by fireworks. I looked to the neighborhood in which I’d lived from the backseat of our small car. I looked back again toward my home from a bus seat as we left Sana’a, and Yemen altogether, to nowhere, pledging to one day return. For four years I have taken refuge in a love that has not left me. Basking in the garden of its finest fruit, it has become my home. Since the first shot, the first missile, and the first blood spilt, there has been no homeland for me. Such is this war, that it has flayed the skin from my reflection and distorted all the features I once recognized as my own. Bilqees Al-Lahbi is a researcher at the Sana’a Center for Strategic Studies where she focuses on Yemen’s political and social developments. Al-Lahabi has more than 15 years’ experience in research, civil society, development and project management. The catastrophic Saudi-led war has shown how Yemen’s complicated geostrategic problems defy any orthodox or simplistic solutions. The war has also amplified the glaring inadequacies of the UN system, and the increasing willingness of the international system to turn a blind eye to war crimes and gross violations of human rights. Four years since the first wave of Saudi airstrikes hit Sana’a, here are three lessons to remember. First, Yemen paid and will continue to pay a heavy toll as long as it remains a fragile and divided republican hut in a neighborhood of monarchical villas. Second, the UN system is in dire need of new ways of thinking and doing that can be responsive to the crises of this century, not those of 1945. Unless it undergoes genuine structural transformation, and abandons its McDonaldization approach to conflict resolution, the UN will continue to let down millions of the world’s marginalized and most vulnerable people. Third, the prolongation of misery and suffering in this war is made possible by a political landscape dominated by the worldviews, morals and ethics of the Trumpists. Khaled Fatteh holds a PhD in international relations from the University of St. Andrews, UK. He is an independent consultant and expert on Yemen and state-tribe relations in the Arab world. Why Has the Coalition Not Yet Won the War in Yemen? As the war in Yemen enters its fifth year, it is reasonable to ask why the Saudi-led military coalition has not yet won the war, despite having billions of dollars worth of the latest military equipment, forces from multiple countries, and technical support from the United States and the United Kingdom. The answer requires examination of both military and political aspects. First, the Houthis: after 15 years of war – first against the regime of former President Ali Abdullah Saleh and, since 2015, against the coalition – what was a small guerrilla movement has gained considerable military experience and strength. This enabled it to gain the upper hand against Saleh’s well trained forces during the Sa’ada wars, later kill Saleh when their alliance ruptured in December 2017, as well as carry out frequent incursions into Saudi territory during the current conflict. Lacking any air force [destroyed in the first hours of the Saudi-led military intervention in March 2015], they have developed drone capacity, as well as improved the range of their stock of East European SCUD missiles inherited from the Saleh regime. Indeed, there is evidence that the technical improvements to their missile force and their strategies have benefited from some advice and assistance from both Lebanon’s Hezbollah and the Iranian regime. However, this in no way brings them to the level available to the Saudi-led coalition either in troop numbers or materiel. Despite all this, they are still far from defeated: if looked at over the long-term, they have risen from a small guerrilla force to a significant army between 2004 and 2019. Second, the Saudi-led military coalition: here we can start with the non-Yemeni elements. Saudi Arabia has largely restricted its intervention to air strikes, which now number close to 20,000 and have killed and injured tens of thousands of civilians. These strikes include many that have contributed to its public relations disaster, such as high profile strikes on funerals, weddings, markets and medical and educational facilities. Are there Saudi ground troops in Yemen? Yes, but not on the main military fronts. Instead, they have intervened to mediate between United Arab Emirates-supported local militias and loyalists of Yemeni President Abdo Rabbu Mansour Hadi in Aden in 2017-18, and in Socotra in 2018. Most recently they have been found in Mahra, currently the site of international rivalries – between Oman, Saudi, UAE and local power brokers – which have little, if anything, to do with the anti-Houthi war. After the killing of more than 50 UAE ground troops in Marib in September 2015, the UAE has significantly reduced the presence of its citizens on the ground, using mainly Sudanese and Colombian troops as ‘cannon fodder’ under Emirati command, both along frontlines in southern governorates and in the fight in the Tihama region along the Red Sea coast. As for Yemeni troops, their alignments and loyalties range widely across the Yemeni political spectrum. While very few can be described as loyal to President Hadi, almost every other political faction is represented. The most important ones include Islah Party affiliates loyal to Vice President Ali Mohsen – former close ally of late President Saleh – operating in Marib governorate, on northern fronts along the Saudi border, as well as in Taiz, al-Bayda, and Shabwa governorates. The second most important group is now the well trained and equipped forces of Tareq Saleh – the nephew of the former president – who operate alongside the coalition forces in the Tihama and are responsible for the main advances towards Hudaydah City since mid-2018. The third are multiple groups of southern Salafis who, loyal to their UAE aligned leaders, are now active beyond the south, despite their reluctance to be involved in the ‘North.’ They also fight in the far north where they are officially under the command of Ali Mohsen but their loyalty to him is questionable. In the Tihama they have often made rapid, uncoordinated and ill-planned advances northwards, leaving themselves open to Houthi counter-attacks. Pressure from the United Nations, the US and others, led to the coalition halting its offensive on Hudaydah in late 2018, and the warring parties subsequently came to an accord which became known as the Stockholm Agreement. The Hudaydah offensive was strongly opposed by world public opinion and humanitarian actors, as it was widely predicted that it would turn a humanitarian disaster into a catastrophe for millions of starving Yemenis. However, the coalition leadership is still convinced that taking Hudaydah would force the Houthis to surrender and they remain committed to this offensive, which helps explain why this agreement is currently unravelling. While world concern is focused on Hudaydah, the recent battles between Houthi forces and the Hajur tribes in Hajjah have not received the attention they deserve. With media attention focused on the civilian suffering caused by the Houthi offensive against a tribe which had previously remained neutral, the political and military significance of this battle has been missed. Had adequate support been given to the Hajur tribes, the coalition would have been able to make significant progress towards cutting all major routes from Sa’ada to Sana’a, thus splitting the Houthi forces into two separate and unconnected areas, a major political and military achievement. Saudi air drops of arms and equipment to the anti-Houthi forces appeared to have had little impact, while the Hadi government ignored offers of help from Tareq Saleh and other Salafi forces in the Tihama after its own orders to transfer forces from Hadramaut and al-Mahra were not implemented. The result is that the Houthis have now taken control of this area and are using their usual ruthless tactics against the population and its leadership, and the opportunity for a major military breakthrough has been lost. This most recent example of the divisions and rivalries within the Yemeni elements of the coalition follows many others, which have been daily reality for years now in Taiz and al-Bayda. Differences between the UAE and Saudi elements [see Aden, Socotra, al-Mahra in the last two years] add to the rivalries between Southern Separatists supported by the UAE and the Hadi government, occasionally leading to Saudi mediation. All these go a long way to explain the lack of progress in the war. Observers and Yemenis alike are entitled to ask whether these are merely signs of political rivalries or whether perpetuation of the war serves other interests, including the enriching of the warlords on all sides. But, on the fourth anniversary of the war, the basic fact remains that millions are suffering and dying as a result of, at very least, the callousness of their leaderships. Helen Lackner has lived and worked for more than 15 years in the three states which existed in Yemen in the past 45 years. She now mainly writes: her latest book is ‘Yemen in Crisis: Autocracy, Neo Liberalism and the Disintegration of a State’ (Saqi, London 2017). A US paperback edition will be published in April by Verso under the title ‘Yemen in Crisis: The Road to War’. To ask where Saudi Arabia succeeded or failed in Yemen is the wrong question. Saudi Arabia lost in Yemen the moment it decided to intervene militarily, and has only continued losing since. 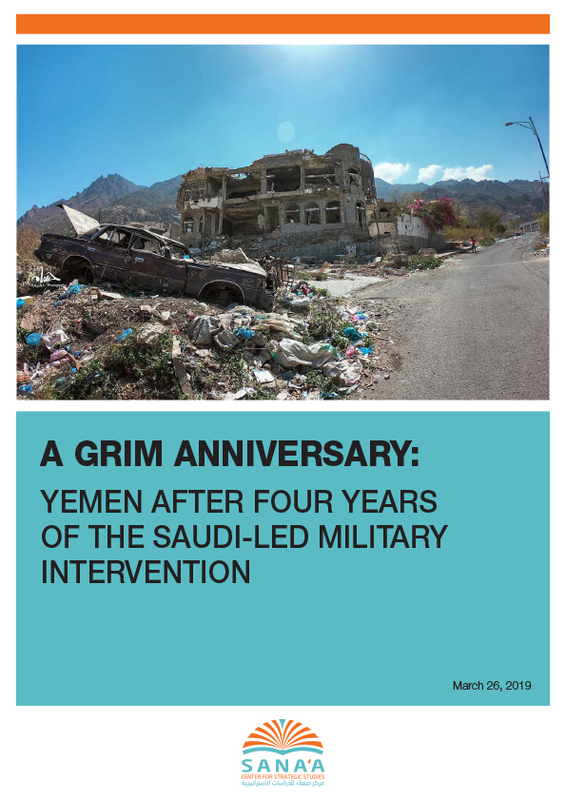 Firstly, the intervention was a tacit admission that Yemen’s transitional process following the 2011 uprising – of which Riyadh was a primary architect and steward – had been irreparably botched. While they say war is politics by other means, that the richest country in the Arab World decided that bombing the poorest was the only means to address this political and diplomatic failure shows weakness and lack of vision, not strength. Four years of ‘Operation Decisive Storm’ – on which estimates peg Saudi expenditures at billions of dollars per month – have been a litany of failures on all fronts: the humanitarian catastrophe has burned Saudi Arabia’s public image abroad; lawmakers in Washington, London and other European capitals are increasingly questioning their relations with Riyadh; Iranian leaders are marveling at Saudi Arabia’s military ineptness in front of a ragtag militia force while simultaneously gleeful that the war has forced the armed Houthi movement to shoulder up to Tehran more than ever. Meanwhile in Yemen millions of people are on the verge of starvation, their economy in ruins, their social fabric in tatters, and their government still in exile thousands of kilometers away in Riyadh hotels. All the while, various factions on the ground, supposedly fighting on the Yemeni government’s behalf, are actively and openly seeking to usurp its authority. In short, Yemen has become Saudi Arabia’s Vietnam. Like that catastrophic American adventure, the losses will only end when those in charge realize that the war is no more winnable today than it was when they entered it. That it is time to stop the armed conflict and try a different approach. Farea Al-Muslimi is chairman and co-founder of Sanaa Center for Strategic Studies. He is also an Associate Fellow at Chatham House. He previously worked for the Carnegie Middle East Center in Beirut and Middle East Institute in Washington, D.C. as a visiting scholar where he covered Yemen and Gulf. The Sana’a Center for Strategic Studies is an independent think-tank that seeks to foster change through knowledge production with a focus on Yemen and the surrounding region. The Center’s publications and programs, offered in both Arabic and English, cover political, social, economic and security related developments, aiming to impact policy locally, regionally, and internationally.